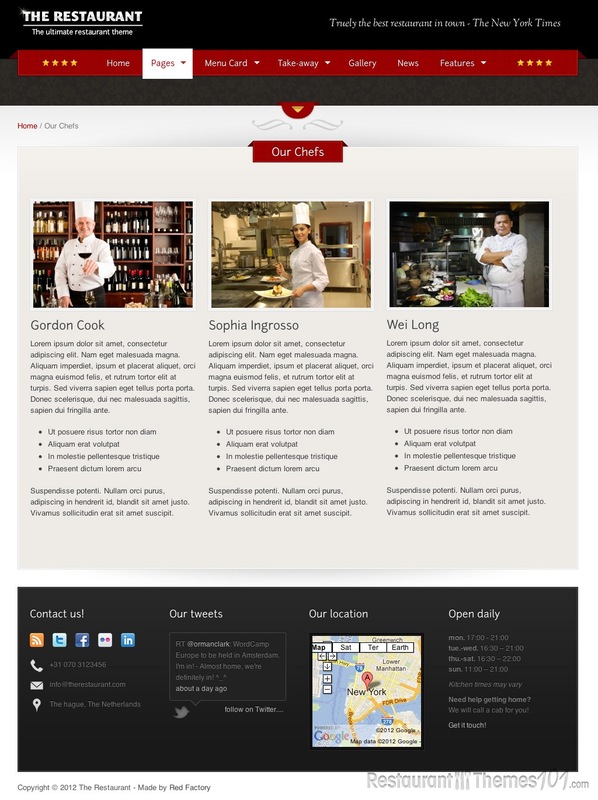 If you own a restaurant, you are surely thinking about creating a website to represent your business online. We all know by now that the internet is the best way to show your business and attract many new customers. There are two problems people have when they think about creating a website – it is very expensive to do it, and it’s impossible to do it all by yourself. Well, that doesn’t necessarily have to be true. There are many themes and templates out there that are very affordable and extremely easy to use. You don’t need to hire a professional and spend a fortune in order to have a great website for your business. All it takes is a good theme. 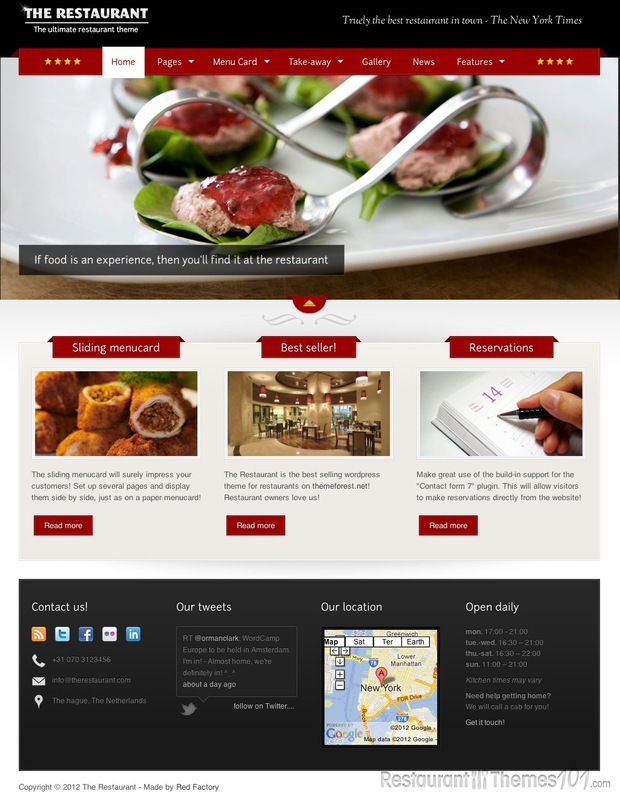 The Restaurant is created by Red Factory and it’s presented on ThemeForest. 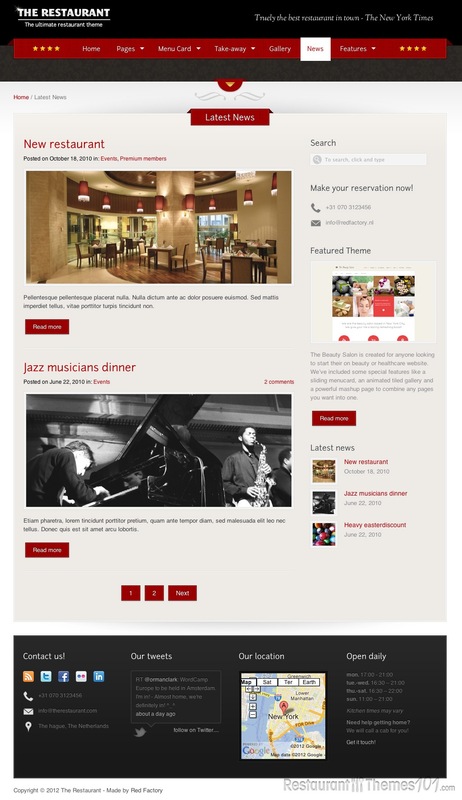 It is a very adjustable and customizable theme with a fine looking layout that will catch the eye of your visitors and make them want to visit your restaurant. You can install the theme on your own very easily because it is very well documented, and you will have full control over your website. The front page features a highly customizable slider. 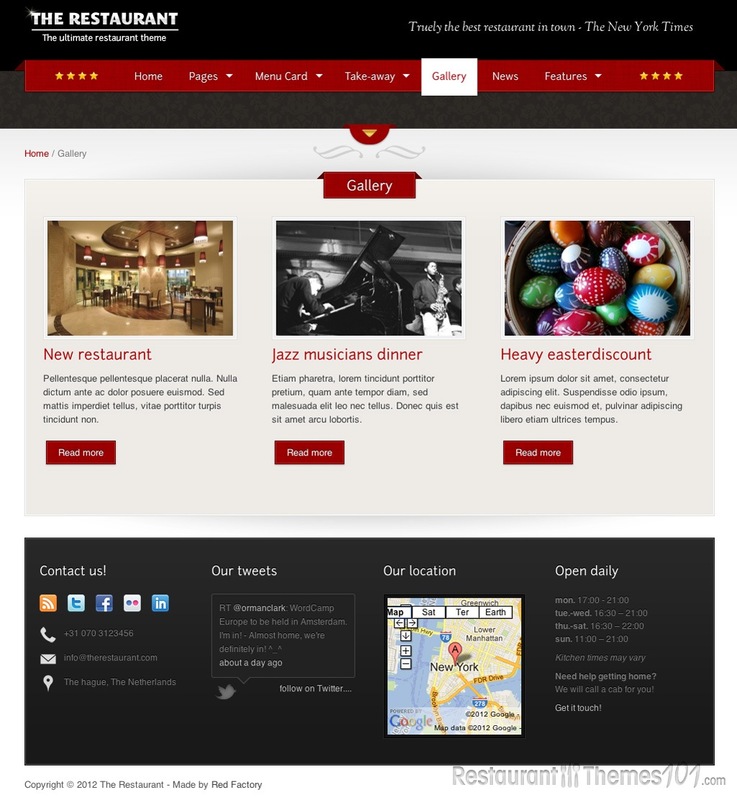 This theme also includes 3 custom page templates. Thanks to the great build-in Cart66 plugin support, this theme can easily be turned into an eCommerce website. You can change the design of this theme easily by simply switching the layout and you can change any given color with the color picker. The image gallery featured is very easy to setup and it looks very classy and attractive. The menu this theme offers is very interesting and creative. 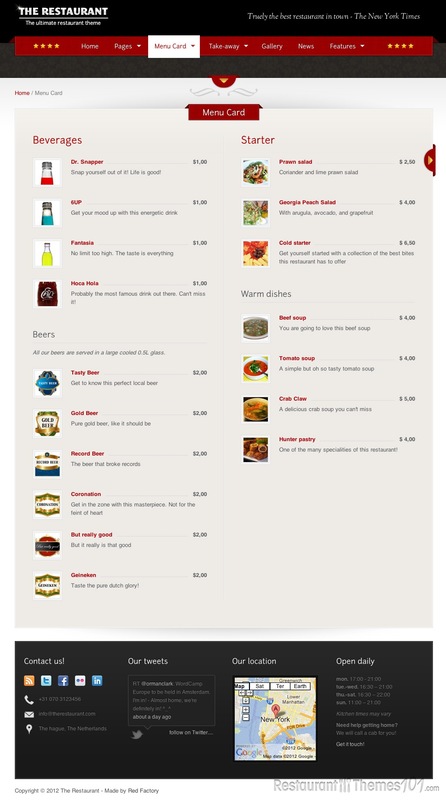 You can easily setup a sliding menu card page and add all the details you need. 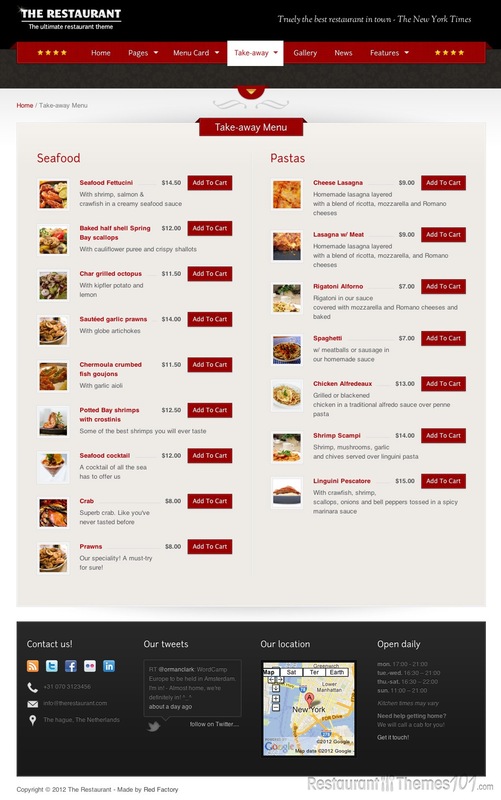 Multiple menu cards are offered and very easy to create. 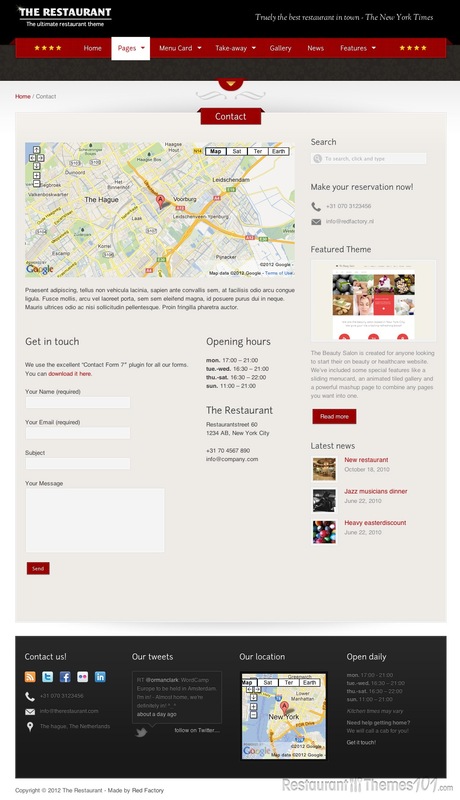 This theme features Google Maps integration so it is very easy for your visitors to find your restaurant even if they are out of town and have no clue about the city directions and streets. They will now have the exact location of your place and they will find you with ease.